Posting after a small gap. took this video time before itself, but some how, unable to touch my laptop itself. hope hereafter will post regularly :). 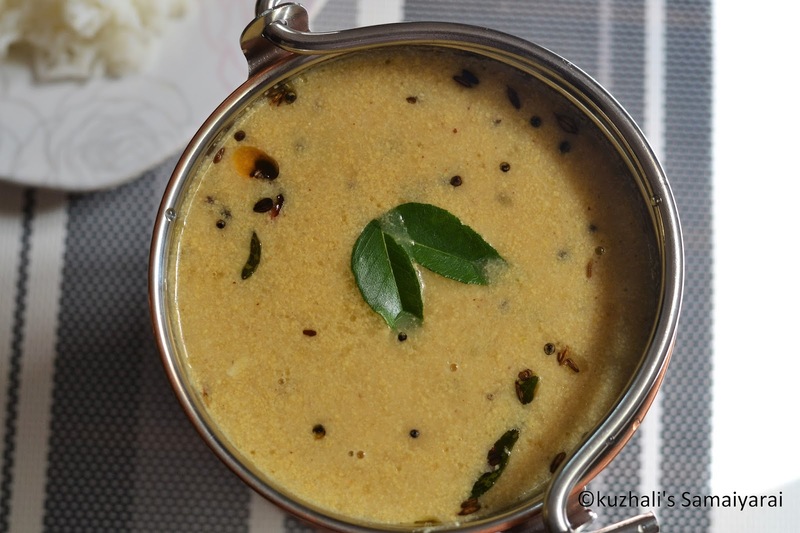 ok now coming to today's recipe Poricha kuzhambu. 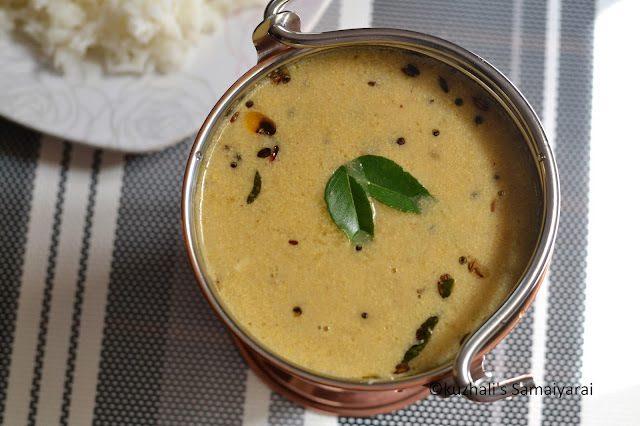 Poricha kuzhambu is one of a stable curry to be served with white rice. It is a perfect option for vegetarians to prepare for lunch instead of our regular sambar or vatha kuzhambu.We can prepare this curry for festival days also as it is a no onion no garlic recipe. Actually I have used few shallots while grinding the coconut. But is it purely optional. You can simply avoid the shallots and proceed. There may be few variations of making this kuzhambu, but what am posting here is the way which we follows in our house. I am just following the procedure which my mom used to do.My mil ‘s way will be little different and that is not a authentic one. Will try to post that version in near future. 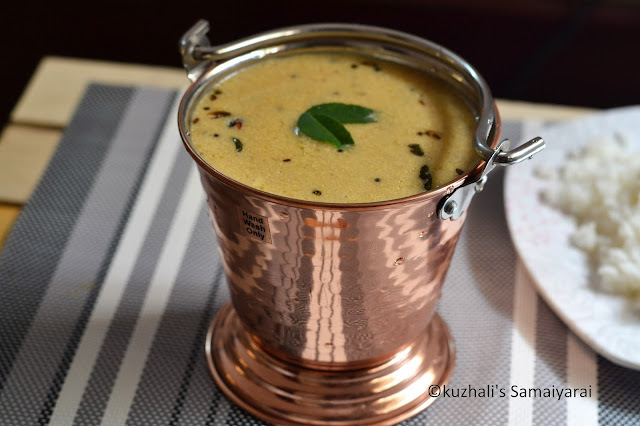 This poricha kuzhambu doesn’t calls for tamarind and uses moong dhal. For flavor and taste we will add ground coconut paste too. In our houses during my grandmother’s period this kuzhambu will also be prepared if we have white rice for dinner. Actually my mom once told, if you add dhal then coconut is not must, but I always use both. So you can add dhal and add little coconut milk at the end instead of coconut paste. In this kuzhambu I have used drumstick. Mango and/or jackfruit seeds can also be added along with drumstick. Drumstick, mango and jack fruit seeds are really a divine combo. I love this combo so much. 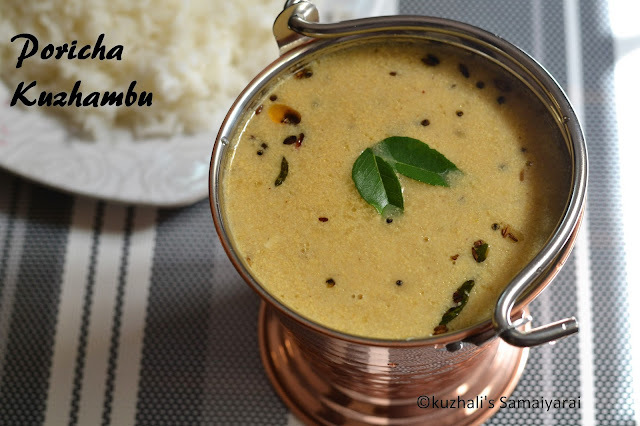 We can make sambhar also in this combo, its flavor and taste will be extraordinary. You can use any of the below vegetables to make this poricha kuzhambu. Please tell me in comments if I missed any of the other vegetables to be used in poricha kuzhambu. * Instead of sambhar powder you can use a teaspoon of red chilli powder and 1 ½ teaspoon of coriander powder. Chop the drumsticks into one inch sized pieces and set aside. Cook the moong dhal till soft. Then mash it well and keep it aside. In a pan add the rice rinced water and let it heat. Add the sambhar powder and salt .Let it boil for 1 to 2 minutes. Then add the drumstick pieces and let it cook by closing the pan with a lid. Once the veggie is cooked completely, add the cooked and mashed dhal and mix well. Finally add the coconut paste and mix well. Let it boil for few seconds. Don’t allow it to boil for more, otherwise the kuzhambu will becomes curdled. If the kuzhambu is so thin , mix the rice flour in little water and add it to the curry. Let it boil for few seconds, kuzhambu will becomes little thick. In another small pan, add oil (preferably coocnut oil) then add the mustard seeds and cumin seeds. Let it splutter. Then add the red chillies, and curry leaves. Saute for few seconds. Switch off the flame and then add the asafetida. Add the tempered items to the prepared kuzhambu. Mix well and serve hot with white rice and any spice vegetable fry as side dish. If you don’t have rice rinced water, then you can add plain water too. Adding shallots is purely optional. Mashing the dhal is must otherwise right consistency will not come. If the kuzhambu is so thin then add the rice flour mix, otherwise no need. You can add little coconut milk at the end instead of coconut paste at the end. Actually we use onion vedagam(vengaaya vadagam/ thaalikra vadam- a special vadagam we prepare in bulk during summer and use for the whole year) to temper. As it is not in hand, I have used the items under temper table. If you have you can simply fry that vadagam in oil and add.